Our company was responsible for the transportation and installation of the exhibition “Odysseus and the Bathers” by New York-based artist Paul Chan, at the Museum of Cycladic Art, curated by Sam Thorne, Director of Nottingham Contemporary. 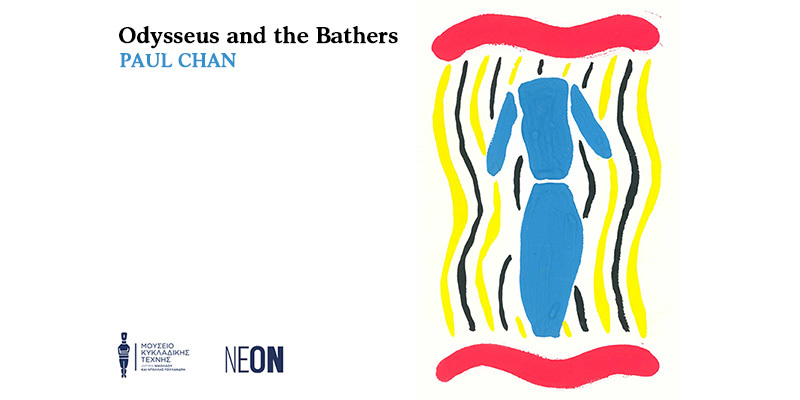 Odysseus and the Bathers brings together a major body of new and recent works by Paul Chan. Since the early 2000s, the New York-based artist’s wide-ranging activities have encompassed sculpture, animation, publishing, performance and education. At the heart of this exhibition is a sequence of bodies in motion. Chan calls these sewn fabric figures “Bathers”, and they belong to a larger series of work, titled “Breathers”, which he started in 2014. Each one is fashioned from a nylon shell attached to modified electrical fans. Drawing from pattern-making as much as from physics, Chan is able to choreograph these “breathing artworks” to create different varieties and shades of motion. The artist sees these turbulent sculptures as acting like moving images, but rendered in three dimensions. For centuries, artists as different as Titian and Matisse have returned to the motif of the “bather”, in order to explore changing attitudes to nature, sexuality and the body. In this exhibition, Chan updates this age-old theme to think about contemporary questions of migration, not to mention our relationship to others and to the past. Alongside his “Bathers” is a presentation of paintings, models and works on paper. In recent years, Chan’s work has been deeply shaped by his reading of ancient Greek philosophy and poetry. A number of the “Bathers” presented here have titles that refer to characters and episodes in Homer’s Odyssey. The exhibition title is drawn from an essay written by Chan called “Odysseus as Artist”, which pivots around the term polytropos. The word, which appears in the Odyssey’s very first line, is frequently attached to Odysseus, and holds many meanings: wily, inventive, infinitely cunning. For Chan, polytropos is critical not only to how artists work but to why art matters today. The exhibition will be accompanied by a full-colour English catalogue, co-published by NEON and Badlands Unlimited, and designed by Kobi Benezri. The publication will include Chan’s essay “Odysseus as Artist”, a new essay by Thorne as well as fragments by the pre-Socratic philosopher Parmenides (5th century BCE), newly translated by classicist Alexandra Pappas, which illuminates how Odysseus’s “cunning” echoes traditions of thinking in ancient philosophy. A conversation between Professor Nicholas Chr. Stampolidis, Director of the Museum of Cycladic Art, and Elina Kountouri, Director of NEON, on the notion of “polytropism” will also be included in the catalogue.